We’ve finished the most recent story arc of Rogier’s epic D&D campaign with my stoic old veteran Alaric Helm and his stalwart companion Lia the half elf misanthropist/ranger (a non standard dual class) defending the border realms of men from a goblin invasion. We’ll be returning there soon after a spell of me running Blades in the Dark for them – a more supernaturally focussed visit to Doskvol as their characters are a Whisper/Leech team faking seances and selling magically infused dream potions to the wealthy and decadent. My other Blades in the Dark campaign is less esoterically focussed with the HellRunner Corp of smugglers dividing their time between hunting down a serial killer in Crowsfoot (now revealed to be an Iruvian diplomat who is being shipped out of the city by his superiors) and getting involved with the machinations of the dreaded Izing Consortium a shadowy group of businessmen who seem to be trying to start a new war in order to boost their profitability. In my Knight City cyberpunk homebrew the former corporate action team DSI-9 are coming to terms with a world on the brink of collapse, with their corporate employers struck down and implicated in the deliberate release of a bio-weapon that has turned Manhattan into a nest of crazed feral lunatics. They’re currently trying to work with the insane biochemist who created the plague in the first place who is dangling a genetic kill-switch for them IF they indulge his every whim. They’ve just smuggled a live victim of the plague through quarantine in the hope this will help in developing the cure. Back in the lands of the Sundered Seven (another homebrew, this time classic Swords & Sorcery), our heroes have assisted in the defeat of the treacherous Lord Osten of Tyaldi and mopped up the supernatural incursion into his stronghold with the aid of some Carcosan influences. They’re now in the great city of Hrafburg hunting down the paymasters of Osten who seek to bring civil war to the land. I’ve also been doing some research so that I can fill out the handouts for a Cthulhu Dark one off that I’ll be running and I’m so far down the rabbit hole of esoteric elliptony that I’m starting to wonder if it’s all real after all. For those unfamiliar with the term, an RTC is a Road Traffic Collision – formerly called an RTA (Road Traffic Accident – they changed the term because it implied accidental cause). 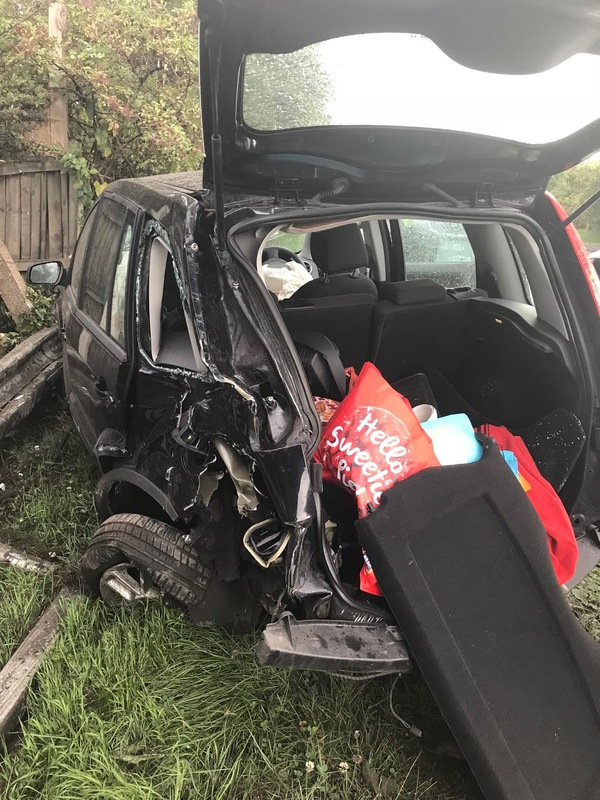 My car was struck by an out of control driver at the end of August and totalled between two impacts from the other driver and the steel roadside barriers. I was knocked out (briefly) and pretty battered but walked away. I had my first bout of physiotherapy yesterday and it went well. I’m still stiff and aching particularly in my back & right shoulder but got off pretty lightly. Finishing Chapter Ten of Crow Journal took a while. It had the potential to be exposition heavy but after a few attempts at it I’ve managed to wrestle it into shape and conveyed – I hope – the information that needs to be conveyed in a way that isn’t too heavy handed and mixed in with some incident and character development that means it works. Again, I hope so. Crow Journal should be about 15 chapters in total so I’m in the home stretch now. And of course A Step Beyond Context remains on sale – If you haven’t as yet read it but think you might be interested in a multi-world Cyberpunk thriller with a Regency drama heroine then you can pick it up at Amazon in paperback or Kindle format.